Fuels like methanol and ethanol are not practical for aviation because they have very low energy densities. Planes would either be severely limited in their range or would not be able to take off thanks to the weight of the fuel they would need to carry. Aviation fuel has an energy density of 42 to 50 MG/kg, which is roughly the same as gasoline. In order for biofuels to compete with fossil fuels, they need to pack more punch. To understand what an aviation biofuel needs to be, it is important to understand what makes current aviation fuels practical. This chart lists the major properties that are required of a fuel that will be used in planes and helicopters. The engines that are found in aircraft come in two types: turbines and piston engines. Each requires a different kind of fuel and so the various aviation fuels will be discussed here briefly. The production of both of these fuels focuses on providing high power outputs and stable performance under the demands of flight. Of critical importance is water. Water in aviation fuel can freeze and cause lines to clog at higher altitudes. This is one of the reasons that alcohols, which tend to attract water, are not useful as aviation fuels. Cold weather performance is the most important factor in aviation fuel besides energy density. This is short for aviation gasoline and it is used in standard piston-engine aircraft (propellers). Its major difference from gasoline is that it is less prone to explosion, has a higher octane, and won't freeze at the low temperatures of higher altitudes. Avgas is generally being replaced by other aviation fuels. Avgas has an energy density of about 45 MG/kg. Jet fuel is similar in many ways to kerosene and comes in two basic types: Jet A and Jet B (there are others, but we don't consider them here). Jet A fuel is designed for use in turbine engines. It is designed to rest explosion by having an autoignition temperature of 210 degrees Celsius. Jet A is subdivided into Jet A and Jet A-1. The major difference between these fuels is freezing point. Jet A fuel freezes at -40 Celsius while Jet A-1 freezes at -47 Celsius. Jet A-1 is used much more commonly than Jet A. The energy densities of these two fuels are nearly identical at about 43 MJ/kg. Jet B fuel is “lighter” than Jet A, which means it is more prone to evaporation and thus more prone to explosion. Its major use is for cold climates where its freezing point of -60 Celsius gives it a major advantage. Jet B has an energy density of about 43 MJ/kg. Despite the challenges, aviation biofuels have seen some use starting in 2008. The first flight, which was undertaken by Virgin Atlantic, used a blend of 20% biofuels. This was followed by 50-50 blends through 2012. Then in Octeober 2012, 100% biofuels was used by the National Research Council in Canada to power a Dassault Falcon 20. In all cases above the aviation biofuels were no different, chemically, from standard fossil fuels. It is the case that direct alcohols cannot be used as aviation fuel because they freeze easily and have low energy densities. However, alcohols can be converted to kerosene, which is the basis for all aviation fuels. Production of kerosene from biomass can occur in several different ways. Research into the use of biological organisms is ongoing and not yet viable. Current conversion processes take the form chemical cracking and gasification, which are energy intensive and do not represent viable solutions to the large-scale production of biofuels. At this point, aviation biofuel is more of a research curiosity than a practical consideration. Where the biomass for producing aviation fuel comes from plays large part in how environmentally friendly these fuels are. Both the type of plant used and the location in which it is grown are important. Several studies have shown that using arid or former agricultural land to produce biofuels feedstock can reduce greenhouse gas emissions. Plants like Jatropha or algae can be grown in these settings and are under investigation for use as feedstock. A study from the Yale School of Forestry has shown, however, that using natural woodland to grown these plants (that is cutting down existing forest to create land for growing plants) will INCREASE greenhouse gas emissions over the use of fossil fuels. To get an idea of just how much land would be needed to meet current demands for aviation fuel, let's consider the following graph, which shows the land areas needed if a particular feedstock is to fully replace fossil fuels in aviation and compares those to well-known land masses. The graph above demonstrates something fantastic. Each year, 809,000 square kilometers of corn are planted, which is a land area roughly twice as large as the U.S. state of Montana. If Jatropha were used exclusively to create aviation fuel, 2.7 million square kilometers would be needed to meet current demand. 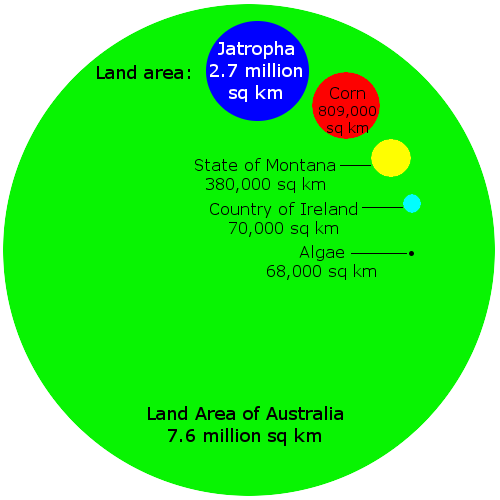 Said another way, about 36% of the land area of Australia would be need to grow enough of the plant Jatropha. It is easy to see that this could have tremendous impact on land use and the food chain. Note that algae require much less area than most other plants, which is why it is of interest to researchers. It is worth nothing, however, that little is known about what kind of impact this would have on local and global ecosystems. A great deal more needs to be learned about biofuel production before it becomes viable.